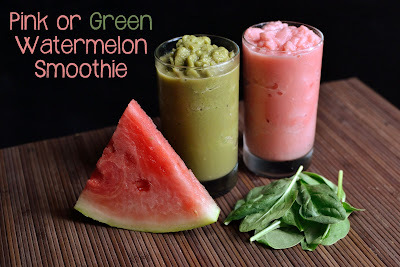 Aside from incorporating lemonade into my smoothies during the summertime, another one of my favorites is watermelon. 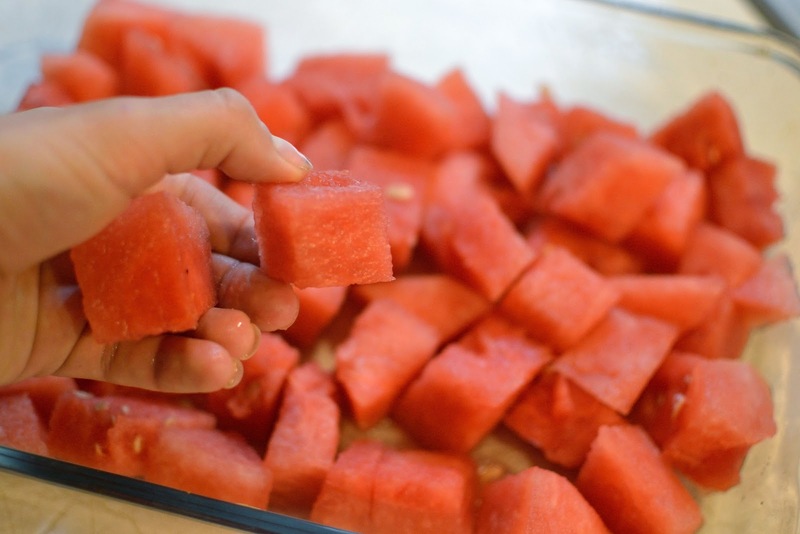 Nothing says summer like watermelon, right? Well, have you ever froze watermelon before? It probably sounds crazy, but the result (when blended with some milk to make a smoothie) is very delicious. Not to mention, hydrating and cooling. What more could you ask for from a summer smoothie?! Unfortunately in our house there is a war brewing between two types of watermelon smoothies. There's "Team Green," my team, that adds spinach to the mix, and then there's the "Team Pink," my husband, Brandon's team, that stays true to the watermelon's original color and just combines it with some milk. Now before you go deciding which smoothie you want to make, here's how to freeze the watermelon. as a snack (not frozen). if the watermelon chunks overlap a bit. Now let's make some smoothies with all that yummy frozen watermelon! The question is...which one will you make????? 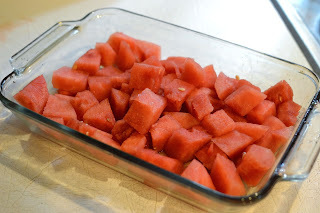 Add the frozen watermelon and blend until combined. So there you have it, one smoothie...two different ways. So which team will you be on? Team pink or Team Green? Post your vote below and we'll see which one is the true "fan favorite". Recently this post was linked up to Frugally Sustainable as part of the "Frugal Days, Sustainable Ways Blog Hop." So check it out and find more ways you can go green! This post was also linked up to "Healthy Vegan Fridays" which you can find any of these three blogs: Everyday Vegan Girl, Veggie Nook, and Carrie On Vegan. So get your "vegan on" and check out some of these great recipes! I used coconut kefir in the green recipe and oh my goodness!! It was delicious! I also added some matcha green tea. Thank you for sharing.